There’s always that one dinner that you grew up eating that you did not like. For some people it might have been meatloaf. Or stuffed peppers. And for others it’s pork chops. Well, here’s why most people remember hating pork chops. They were always dry. And chewy. And not very flavorful. Guess what? I’ve fixed that problem for you! Gone are the pork chops of your childhood. Say hello to 2019 pork chops. The good ones. 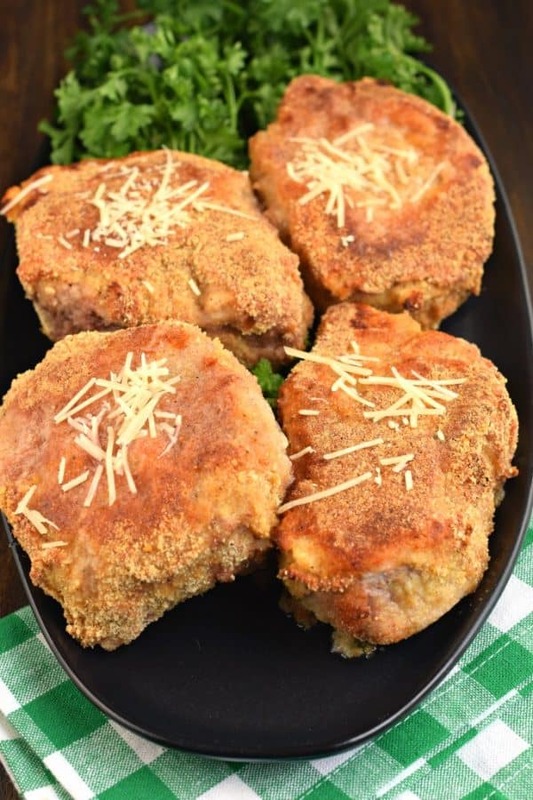 Delicious, moist, FLAVORFUL pork chops. 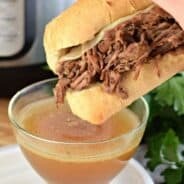 There are a few reasons why my recipe is THE BEST you’ll find. 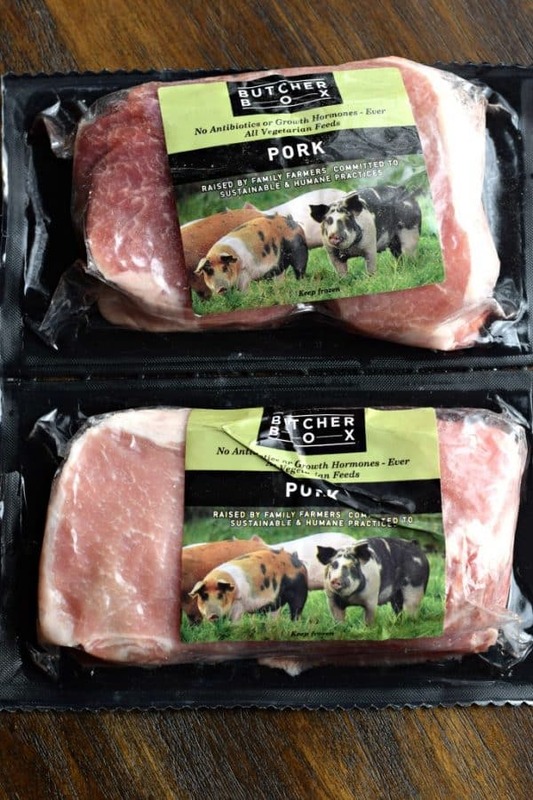 First, you’ll want to start with the perfect cut of pork. I bought these double thick, boneless pork chops. They turned out so moist and juicy and have a thick strip of fat along the rim. It’s easy to trim off after cooking your chops! Next, I double dip my pork chops in my eggs and dry ingredients. Sure, once COULD be enough for some, but why not make a thick coating of flavor for your thick pork chops? When baking, flip your pork chops halfway through. 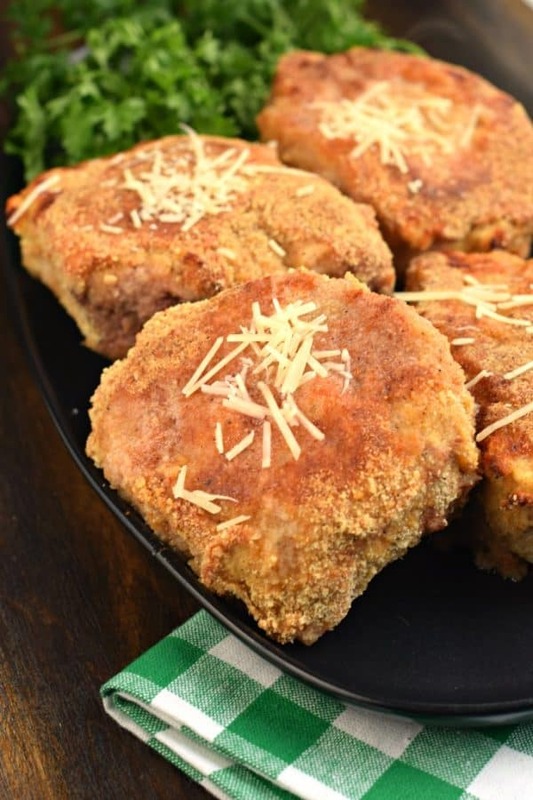 Not only does it help create even cooking, but you’ll get a tender, browned crust on both sides of your pork chop (instead of a soggy bottom crust). Finally, cook your pork chops to a temperature of 145 degrees F. Back in the day, our parents were told to cook pork chops until no longer pink, and cook until 160 degrees. Well, those rules have changed, and a little pink in the pork chop is acceptable (and encouraged for flavor)! In a shallow bowl, whisk 3 eggs together until blended. In another shallow bowl (or pie plate), combine parmesan cheese (grated works best), breadcrumbs, paprika, salt and pepper. Use a fork to blend completely. Line a large baking sheet with foil for easy clean up. Pat your pork chops dry with a paper towel. Dip your porkchop (on both sides) into the beaten egg, coating completely. Then immediately dunk it into the dry ingredients. Use your hands to really press and pat on the parmesan breadcrumb mixture. Repeat by dipping the same pork chop back into the egg, then again into the bread crumbs. Make sure to really press the mixture over the pork! Place on your baking sheet. Now repeat this process with your remaining pork chops. Bake in the oven for about 45-60 minutes, really making sure to use a meat thermometer to check the doneness. If your pork chops are thinner, shoot for 25-35 minutes. One more instruction, at the halfway baking point, flip your pork chop over using a pair of tongs. 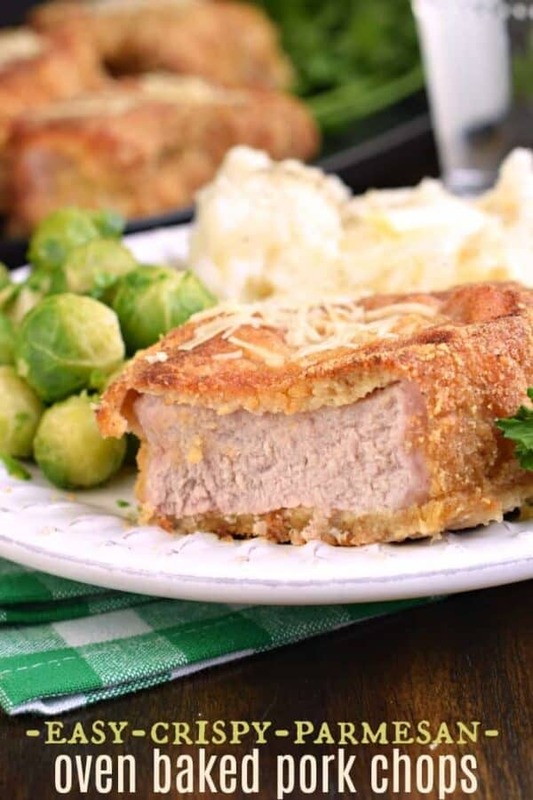 This will help your create a crunchy crust on BOTH sides of your pork chop. To serve, sprinkle with a little bit of shredded parmesan cheese and fresh parsley! 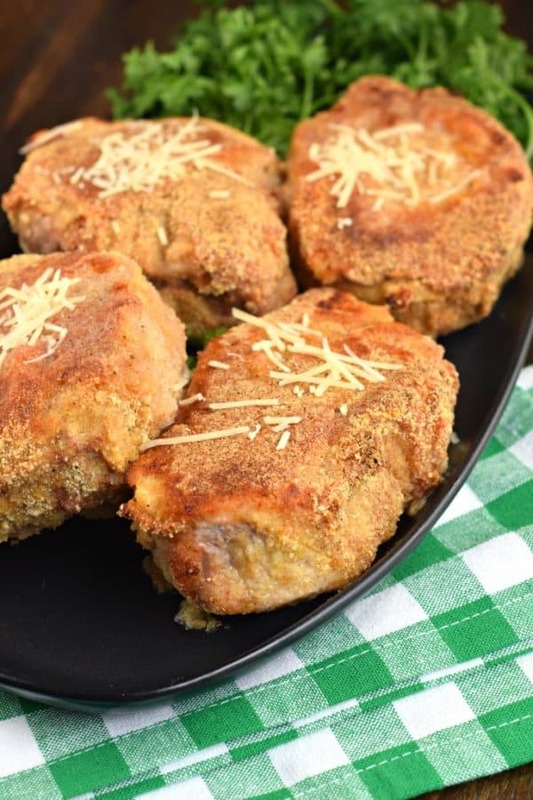 To get the most flavor in your baked pork chops recipe, you’ll want to use grated parmesan. Whether you freshly grate it yourself, or use the stuff in the green can, you’ll get maximum flavor by choosing this option over shredded. Shredded parmesan cheese will make a great garnish on today’s pork chop, however it won’t make a nice topping. You want to opt for the grated to help make your crunch crust, as it blends well with the seasonings and breadcrumbs. This is a common question. The thicker the pork chop, the longer you will need to bake them in the oven. The boneless pork chops that I used were close to an inch thick. They required about 45 minutes in a 350 degree oven. Bone-In pork chops require about 10% MORE cooking time, so make sure you factor that into your planning if you bought pork chops with bones. Thinner pork chops will take approximately 25-35 minutes, while VERY thin *under 1/4 inch* will be even less. Your best friend when cooking pork chops is a meat thermometer. I rely on this instant thermometer for all my meat cooking needs! Well they say “pork chops and applesauce” go together like peanut butter and jelly! This easy, Instant Pot Apple Sauce recipe will have your homemade applesauce on the table in less than 30 minutes! Tender Pork Tenderloin seasoned with a Chipotle marinade and drizzled with a Cilantro Lime Sauce. This is one weeknight dinner dish that my whole family loved! 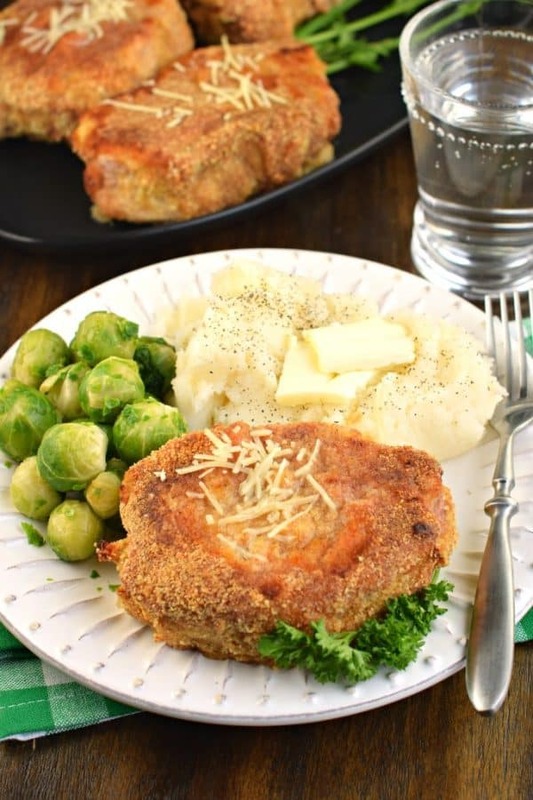 These Breaded Pork chops with Peach Glaze have a homemade shake and bake breading! So tasty! 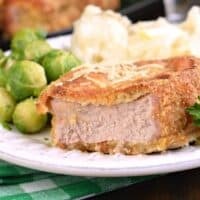 Thick Apple Stuffed Pork Chops with Herbed Gravy. Perfect for family dinner or having company! In a shallow dish, whisk eggs until well beaten. Set aside. 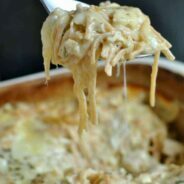 In a separate shallow bowl, blend parmesan cheese, bread crumbs, salt, pepper, paprika and garlic salt together with a fork. Set aside. Dip pork chop in egg mixture (both sides) and then into the bread crumb mixture, pressing gently to coat pork chops. Repeat process and dip a second time in the egg, then again in the bread crumbs. Place on baking sheet lined with foil. Repeat for remaining pork chops. 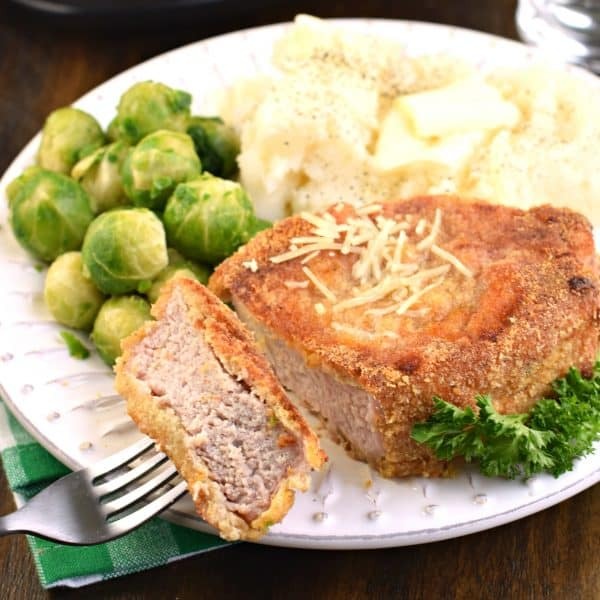 Bake for 45-60 minutes or until internal temperature reaches 145 degrees F. For thinner pork chops, bake 25-35 minutes. Allow chops to rest 5 minutes before serving. Sprinkle with shredded parmesan and parsley for garnish. ENJOY. Wow these look so tasty! I wonder if I could use my air fryer for this recipe? These chops always turn out tender and delicious! Love them! Oh we do ButcherBox over here. Love it! My family really enjoyed this! A new favorite in my house! I love how easy they are to make! A weekly menu must have for sure. 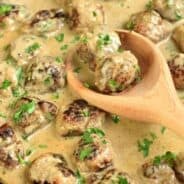 I’ve been wondering about Butcher Box. Thanks for sharing your experience. You may have pushed me over the edge to try it! And those pork chops… yum!! My mom use to make port chops all the time as a kid. Can’t wait to give these a try. Thanks! Now that’s my kind of pork chop! They are so crispy and juicy at the same time. These were so easy to make and super tasty! Definitely a new family favorite! This is a great dinner idea, thank you! Great coating for pork chops! How tasty, I made this last night and the whole family loved it!